Every year 40,000 women die of breast cancer. Hologram ultrasound technology is about to put a huge dent in those numbers. 175,000 are currently diagnosed and this doesn't include cervical and ovarian cancer. This means that one out of eight women will be diagnosed with breast cancer in their lifetime. Since the 1980's, different people have experimented with holograms and ultrasound together for there use as a diagnostic tool. There are several competing technologies being developed, but there are similarities in them too. What is a hologram? Merriam-Websters dictionary says ": a three-dimensional image reproduced from a pattern of interference produced by a split coherent beam of radiation (as a laser); also : the pattern of interference itself" Advanced Imaging technologies based in Washington state is developing a system using holography and through-transmission ultrasound to produce a three dimensional image using sound waves that pass completely through the breast, where ultrasound alone only echos off the breast tissue. Breast ultrasound has always had a problem because of the density of the tissue involved. It has an intricate system of veins and glands that make it difficult to get clear ultrasound images. That is why a breast has to be squeezed between ultrasound transducers and it still doesn't screen very well. "It's like trying to image tree roots,” says Todd Garlick, lead engineer at AIT. "Imaging dense breasts is like trying to see through a smokey room versus a clear one, and the denser the breast tissue, the harder it is to see cancerous tissue in and among the complex breast anatomy." Allowing the sound waves to pass completely through the breast, the images are not clouded by dense breast tissue. A second wave is transmitted simultaneously to create a 3D hologram. 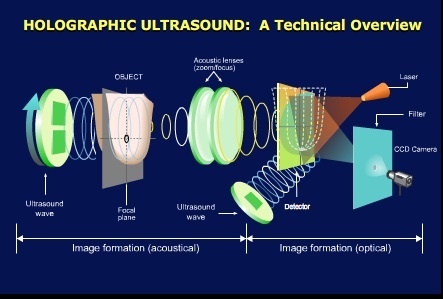 The resulting images of Hologram ultrasound technology offer fine details that are missed with today's ultrasound. In a normal MRI or ultrasound screen, we cannot visualize some early markers of breast cancer such as calcification. X-Rays are still needed for this. Meanwhile, In Children's Hospital in Boston led by Pedro del Nido, MD, and Nikolay Vasilyev, MD, of Children's department of cardiac surgery, had already been testing a three-dimensional hologram ultrasound imaging system. Using an idea brought in from X-box, cardiac surgeons report good results with a simple technology borrowed from the gaming industry: stereo glasses. With these glasses, you can actually feel like you are inside the heart. children's hearts being smaller, this could be a big step forward in being able to perform beating heart surgery. They had been using 4D imaging to assist in surgery, but the tools gave very little depth. They tried it with animals with minimal success because they would get disoriented, navigating surgical tools when guided by normal ultrasound. Del Nido, chief of Cardiac Surgery at Children's, realized that what they needed was stereoscopic vision. He said "Watching the flat picture on the computer screen was like watching a baseball game on TV, he says. "It's good enough to follow what's happening in the game, but you could never grab a ball in mid-flight" Del Nido collaborated with Robert Howe, PHD Harvard University in hologram ultrasound to split two computer images that were on slightly different angles and borrowed gamers' flickering glasses to see ultrasound images of a beating heart in hologram. "You definitely have depth perception," says Vasilyev. "You feel like you're inside the heart chamber. Another development in hologram ultrasound came from Purdue University with a digital hologram ultrasound imaging system. David Nolte, professor of physics created a device that permits one to watch in 3-D how anticancer drugs fight tumors. It uses a laser that does not harm living tissue combined with a common microchip used on digital cameras to see inside tumor cells. The innovation of this is that the holograms are not just producing an image, but are viewed in real time allowing a doctor to track and adjust the image in intensity and phase. They used the unit to observe the response of tumors to anticancer drugs in real-time, 3-D images. Further, we can "see" through turbid media, such as skin or other tissue, looking for lesions and carcinomas that cannot be seen by eye alone. We can create a sensitive holographic ear that can listen for ultrasound signals using lasers. We can receive femtosecond laser pulses that have been distorted by propagation down a fiber optic, and remove the distortion automatically as the system even adapts in real-time to changing distortions. In each of these applications, we rely on the moving hologram to adapt to a changing environment. The holograms "shimmer" said Nolte. It uses the full spectrum of light even that which is beyond human perception. By shining the laser on the object and the chip from the digital camera, the system interprets the reflected echos with extremely detailed information, including depth and motion. The scale is in microns, which is 0.0001 centimeter. "We can look at a fairly large section of the object, about a 30-micron-thick section of a 700-micron-thick tumor," Nolte said. "At the same time, we can retrieve information within the micron scale. Biologists currently have to look at things on the cellular level through microscopes. With hologram ultrasound, we now can detect things on the cellular level and the tissue scale at the same time. In this case, the whole is greater than the sum of its parts. Tissue is more than just an accumulation of cells. It is a communication network in 3-D that behaves differently from 2-D cell cultures." There are other technologies out there, but If you liked Hologram ultrasound, please check the ultrasound smartphone. If you want to be independent. Take advantage of this life-changing opportunity to achieve your dream. All you need is motivation and a strong desire to learn. The most cited reason for small business failure is a lack of planning. Solo Build It! 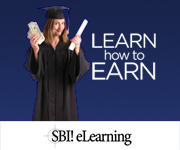 eLearning helps you plan for the short and long term.